I think it's very important to have some me time every now and then to just pamper yourself and truly enjoy relaxing. Between busy schedules, stress, blogging and whatever else it may be I feel like people sometimes forget to take a step back and just take an evening for themselves. So this is me telling you while your reading this, either take a few hours out this evening to just chill or to set a pamper evening for the weekend. Trust me when I say it'll do you a world of good. When it comes to my pamper evenings I will admit that I put more effort into some and then sometimes I just have a small little one that is more focussed on just relaxing. I usually have a shower and use my current favourite products (find post here). Then I pick out a pair of fluffy pyjama's which usually have Thumper or Bambi on them (would you expect anyone else from me?!). I don't tend to blow-dry my hair as I've been letting it dry naturally so I just push it back with my Bunny eye mask and then apply some of the Zoella Wonder Hand hand cream and let that soak in. This is where I would suggest also getting yourself some sweet treats or even a hot chocolate because it doesn't hurt to let yourself indulge into some sweetness every now and then. Now it's time to apply a facemask. Depending on what mood I'm in will decide the kind of facemask I want to use. If I'm feeling lazy I usually opt for a sheet mask as theres no mess involved in them however if I feel like my skin needs a little help I'll usually use a mud mask of some sorts. Recently I have been loving the Anatomicals one's and the packaging always has me laughing! When I get ready to relax I usually like to spray myself with some perfume, it's almost like a habit that I spray something every few hours a day. Recently I cannot get enough of the So...? Kiss Me* fragrance. It's super sweet and the scent lingers for awhile which I really like. Finally it's time to pick a movie, usually when I want to have a relaxing evening theres no movies that interest me on Sky so I usually end up picking out some DVD's. Of course they're going to be Disney movies because really is there any better kind? Do you take time to yourself every now and then? 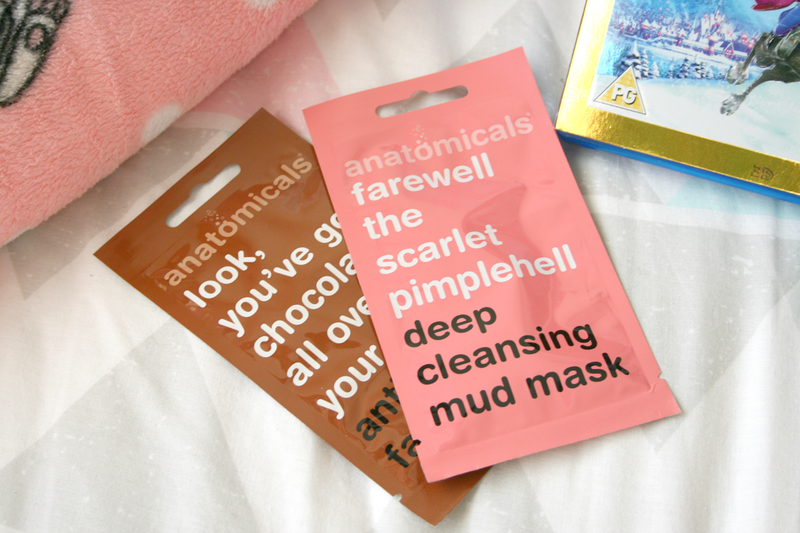 oh I had no idea Anatomicals did a deep cleansing mud mask! I wonder how well it does for the skin? 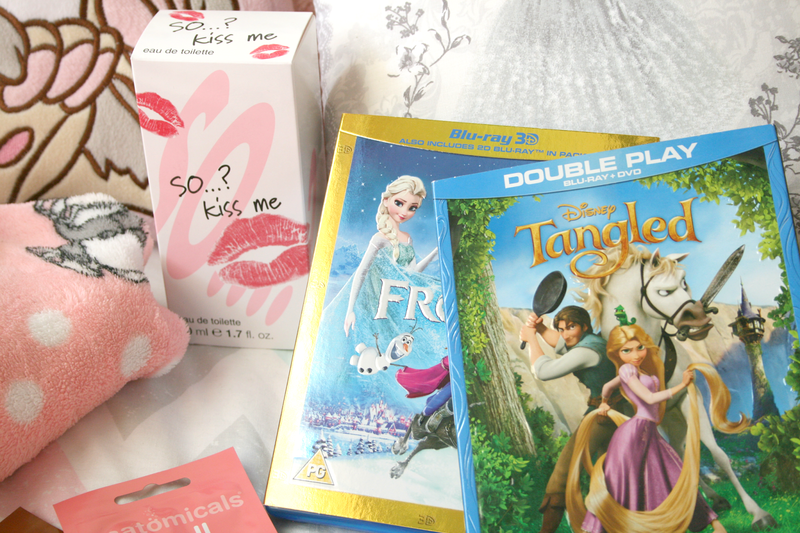 love Disney movies! Little Mermaid and Cinderella are my favorites .. and that pj's are so cute! 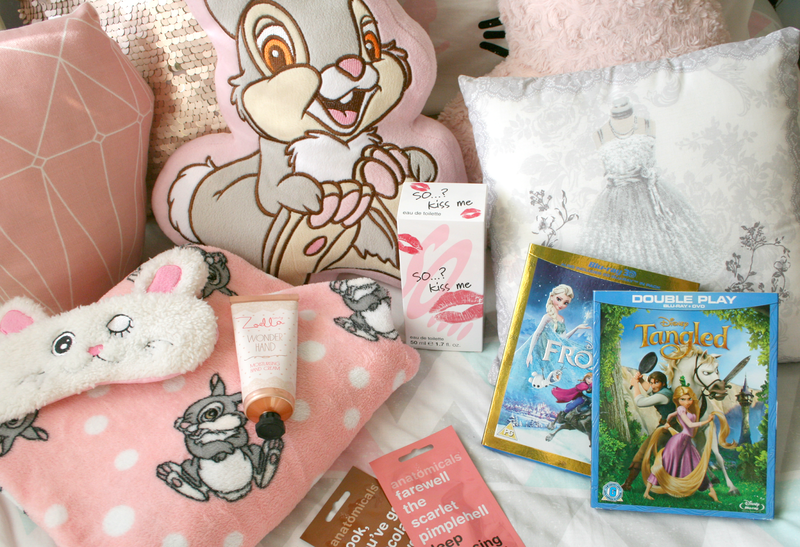 First, I always love your Thumper pillow in your photos! Second, I really like this post! I think a shower is a great way to start a night taking care of yourself - it just makes you feel refreshed and helps you shake off everything that happened during the day if you do this on a week night.